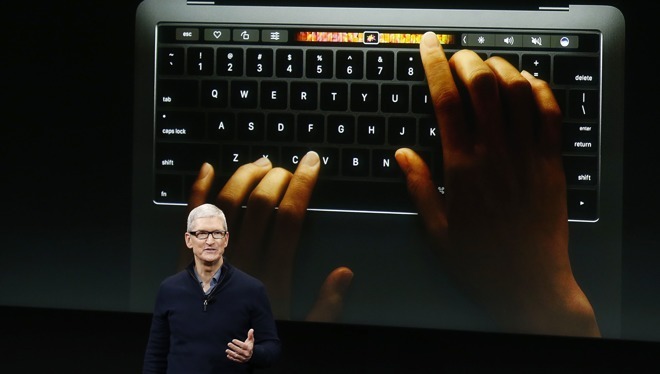 Apple Chief Executive Tim Cook this week took a swipe at Mac sales estimates, as true sales figures came in higher than predicted by Gartner, pushing Apple to a third consecutive quarter of growth in both volume and earnings. In Tuesday's quarterly earnings report, Apple declared sales of 4.29 million units of Macs, up slightly from the same period in 2016. While not as profound a jump as the holiday quarter when the 2016 MacBook Pro launched, availability of new machines for the most recent quarter was for only half the reporting period or less, depending on configuration. Gartner's preliminary statistics, published July 12, showed Apple rising one spot to end the quarter in fourth place with 4.24 million units shipped to vendors and sold to customers directly. The estimated performance was down 0.4 percent compared to last year, when the company sold 4.25 million Macs. The difference in units between Apple's actual sales numbers and Gartner's shipment estimates means that the company had a year-over-year growth in the Mac, not a contraction. Apple has maintained Mac sales growth for the entirety of the 2017 fiscal year. According to the same estimates, Apple captured 6.9 percent of the worldwide market for the quarter, up from 6.7 percent in the second quarter of 2016. At the time, AppleInsider noted that the numbers seemed peculiar, given Apple's wide swath of updates of its Mac line in June at the WWDC. Cook declared in the earnings conference call that the Mac's volume worldwide has grown seven percent year-over-year. Cook also noted that the growth was despite IDC's latest estimate of a four percent contraction in the PC market. Gartner predicted in January that worldwide device shipments of PCs, tablets, and smartphones would remain static until 2018. While that may be the case industry-wide, Apple's actual sales figures have exceeded Gartner's shipment predictions consistently —and the rest of the industry reports shipments, not actual sales. It is not clear when Apple will refresh its product lineup again. Apple updated its MacBook Pro and iMac lines at the WWDC, and teased the forthcoming iMac Pro which will start shipping later in 2017. In April, Apple said that there was a new Mac Pro coming, but not in 2017, and that the Mac mini was an important part of the company's product plan.